It´s been a while, I know. My mum made 70 on Monday and I wanted to make her a surprise. I packed my bag, sit on a plane and went back home. Just seeing my dad's face when he opened the door, feeling my mum's hug, the tears in my sister's eyes and the smile on my nephew's face... all of it was more than worth. I loved spending these few days with them, staying until late speaking and laughing. I came back home full of energy. 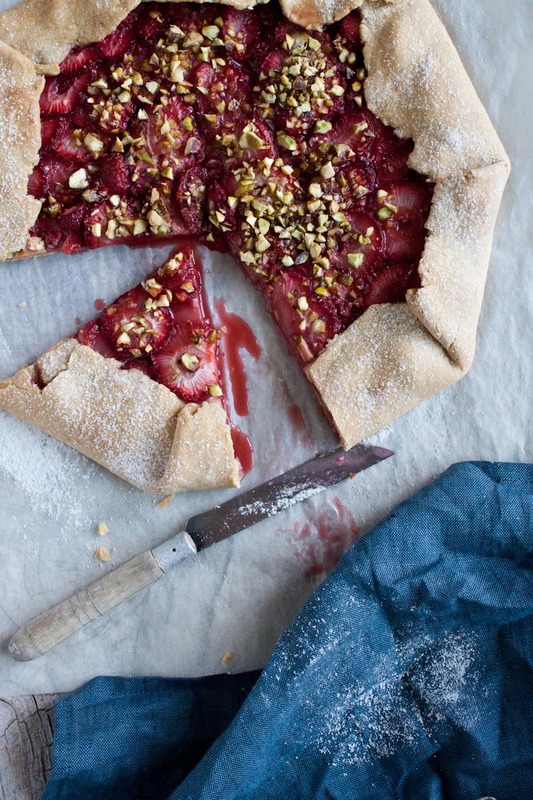 On my trip back to Lisbon, I was thinking on how much I would like to eat something with fruits, not so sweet, crunchy and juicy... what else than a galette full of fresh strawberries and some pistachio on top of it? It's such an easy recipe and the perfect summer deal. Já passou algum tempo, eu sei. A minha mãe fez 70 na segunda-feira e eu queria fazer-lhe uma surpresa. Fiz a mala, sentei-me no avião e fui a casa. Só por ver a cara do meu pai quando ele abriu a porta, sentir o abraço da minha mãe, as lágrimas nos olhos de minha irmã e o sorriso no rosto do meu sobrinho... por tudo isso valeu muito a pena. Adorei passar estes dias com eles, ficar até tarde a falar e a rir. Voltei para casa cheia de energia. Na viagem de regresso a Lisboa, estava a pensar no quanto eu gostaria de comer algo com frutas, não muito doce, crocante e suculenta... o que mais senão uma galette cheia de morangos frescos e alguns pistachios por cima? É uma receita fácil e perfeito para o verão. In a mixer, mix the margarine, flour, salt until you get fine crumbs. Add the egg yolks, one at a time and beating well after each addition. Mix until incorporated. Add milk to moisten it. Dump the whole mixture onto a lightly floured board and gather the dough into a smooth ball. Flatten the dough into a disk, wrap it in plastic wrap and refrigerate for an hour. 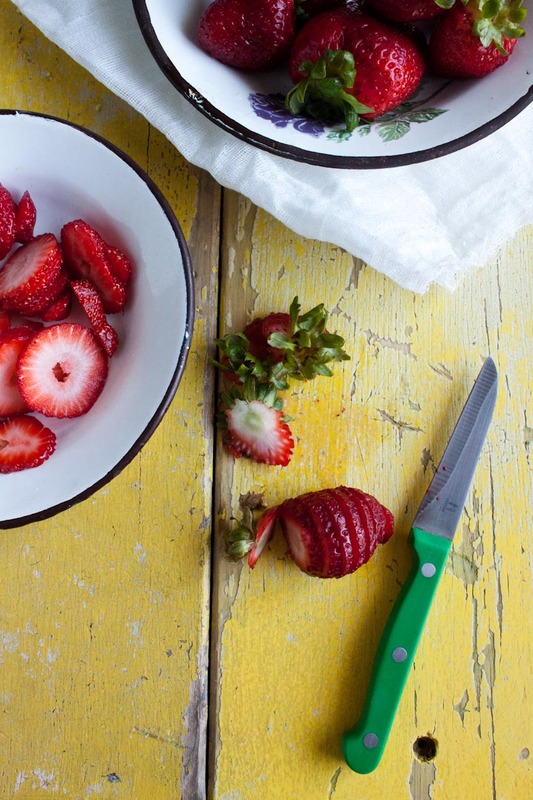 While the dough is resting, cut the strawberries and add sugar. Preheat oven to 180ºC and position the rack in the center. When the dough is nice and cold, roll it out on a lightly floured board. Arrange the slices of strawberries in the center of the round and gather the edges, pleating as you go with your fingertips. 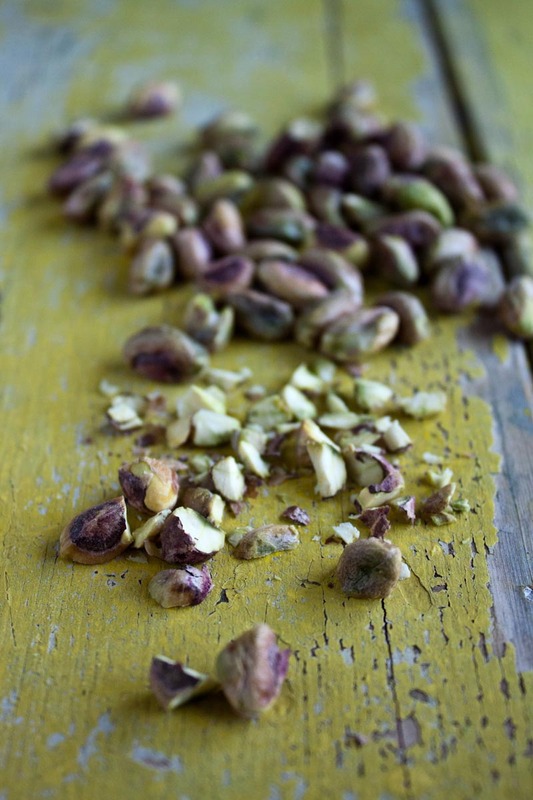 Sprinkle with chopped pistachio. Place the galette on a baking sheet and bake for about 30-35 minutes. Numa batedeira, misture a margarina, a farinha, o sal até obter migalhas finas. Adicione as gemas, uma de cada vez e batendo bem após cada adição. Misture até incorporar. Adicione o leite para humedecê-la. Despeje toda a mistura numa tábua polvilhada com farinha e reuna a massa numa bola lisa. Alise a massa num disco, embrulhe-a em papel aderente e deixe no frigorífico durante uma hora. Enquanto a massa está em repouso, corte os morangos e adicione o açúcar. Pré-aqueça o forno a 180ºC e posicione o tabuleiro no centro. Quando a massa estiver boa e fria, retire-a sobre uma tábua polvilhada com farinha. Disponha as fatias de morangos no centro do círculo e reuna as extremidades, fazendo pregas com os dedos à medida que avança. Polvilhe com o pistachio picado. Coloque o galette no papel vegetal e leve ao forno durante cerca de 30-35 minutos. Delicious pictures as always, loved the recipe! Sanda, izgleda prekrasno :)! Lepo si se provela, nije ništa lepše kao vidjeti svoje draga nakon dužeg vremena...:). how wonderful Sanda, such a special surprise for your family and gift of time for you. these photographs are beautiful Sanda, love all the colours and textures! Sanda, your photos are incredible- and I'm an fairly certain this tastes as good as it looks! what a beauty! glad you visited your folks at home. happy birthday to your mom! isprobala i oduševljena. obožavam tako jednostavne stvari... može da se kombinuje sa raznim voćem. A imam i neke slane varijante na umu...It's a keeper! Hvala drugo,javi kako je ispalo. What a wonderful surprise you gave your family! I sat next to a girl coming back from vacation. She was on a flight to Texas to surprise her mother for Mother's Day. I thought it was so endearingly sweet. But, I popped in because I am ALWAYS a sucker for a beautiful galette. Your galette is beautiful! Can I use other types of flour instead?? It's difficult for me to find spelt flour/wheat flour in my neighbourhood. What flour did you want to use? Wheat flour is most common flour for baking..
Can I use all-purpose flour instead?? Ohh.Thank you so much!! So gonna try this soon. Thanks again! !